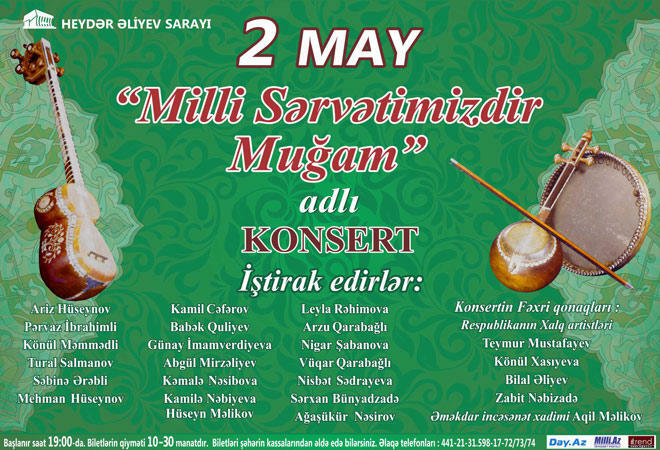 The Heydar Aliyev Palace will host a concert titled "Mugham is our national heritage" on May 2, Trend Life reports. The concert program will involve talented young mugham performers such as Ariz Huseynov, Parvaz Ibrahimli, Konul Mammadli, Tural Salmanov, Sabina Arabli, Mehman Huseynov, Kamil Jafarov Babek Guliyev, Gunay Imamverdiyeva, Abgul Mirzaliev, Kamala Nasibova, Kamila Nabiyeva, Huseyn Melikov, Leyla Rahimova, Arzu Qarabagli, Nigar Shabanova, Vuqar Garabagli, Nisbet Sadreeva, Sarhan Bunyadzade and Agashukur Nasirov. Azerbaijan’s honored artists Teymur Mustafayev, Konul Xasiyeva,Bilal Aliyev, Zabit Nabizadeh as well as the Honored Art Worker of Azerbaijan, Aqil Melikov will also participate in the event. The media partners of the event are : Trend, Day.az, and Milli.az. Mugham is one of the most valuable monuments of the material and spiritual culture of the nation and the greatest achievement of the musical and poetic art of the Azerbaijani people. The peculiarity of mugham itself firstly with the development of a modal system. It contains seven main modes - Rast, Shur, Segah (are especially common), Shushtar, Bayaty-Shiraz, Chahargah, Humayun and three collateral kinds - shahnaz, sarendj, chargah in some other form. Every mode represents a strongly organized scale, possessing a firm tonic prop (maye), and each step of the mode has its melodic function. Mugham entered into global cultural heritage at the beginning of the last century by attracting the attention of cultural experts and music critics around the globe. The lyrical music of Mugham attracts the young and old with its delightful sounds. At present, this pearl of Azerbaijani music art continues to take new forms, attracting attention worldwide. Don't miss Cinema Hits Show!